Its been three months since I updated this blog and a lot happened since my last. Back in May I was feeling my game was eroding, my skills diminishing and maybe I was starting to let my teams down. It turned out to be a pretty good summer on the ice and maybe I'm settling in to the idea of enjoying the ride for as long as I can. 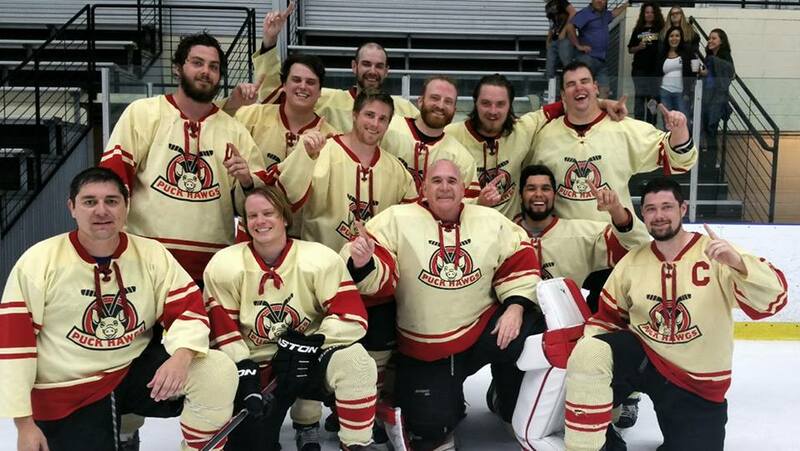 My Puck Hawgs finished the summer season 9-1 and won the league championship with a 6-3 win against one of the best teams in the division. After feeling like my game was in serious decline, I seemed to get my head on straight and I played the second half of the season better than the first. I didn't find a fountain of youth or suddenly become lighter and faster but my mental attitude improved- in part from some terrific support from my team mates. A few words here and there make a difference. Knowing the rest of the team doesn't consider every goal a disaster and then watching them respond with heart and effort to put goals in the other net has an effect on my play and I'm guessing other beer league goalies out there. 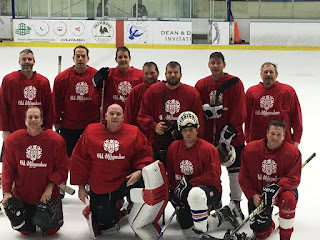 What happens when you throw together a bunch of guys of mixed skill levels, who have never played together and all old as dirt? A tournament team! 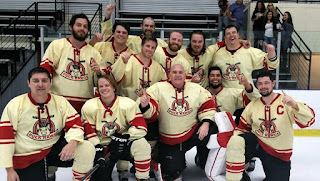 I played net for a summer 35+ tournament team called Old Milwaukee and we finished our run with the championship. Sure it only took us 5 games to get there but it was a terrific time with a fun bunch of men and women. My pal Paul and wife Amy joined me which made it all the better. After playing some really ragged games where I was sloppy, I went into the final game with a positive and confident attitude. I had to force myself to be in that mental state after an absolutely humiliating 9-8 overtime loss in the previous game. 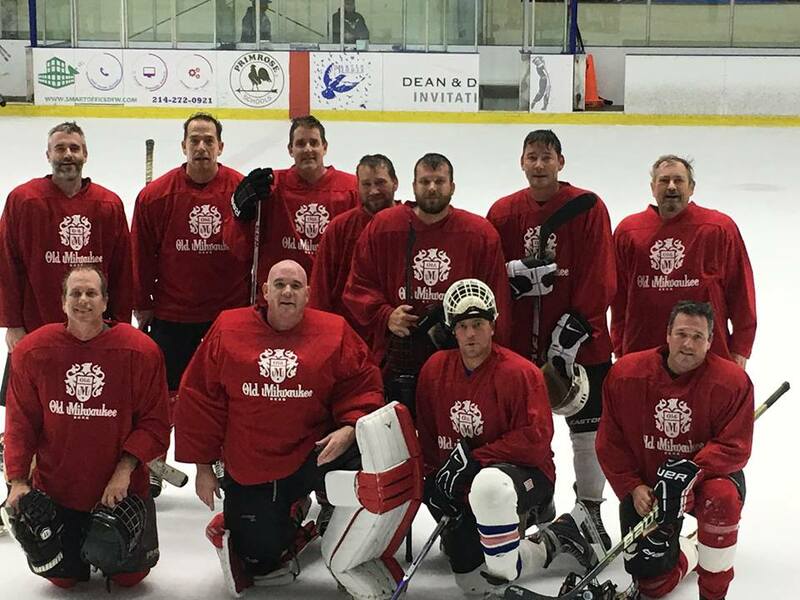 45+ shots later, Old Milwaukee had the shutout for a 3-0 tournament win and I played as sharp as I have in months. So maybe my game isn't on the rise. 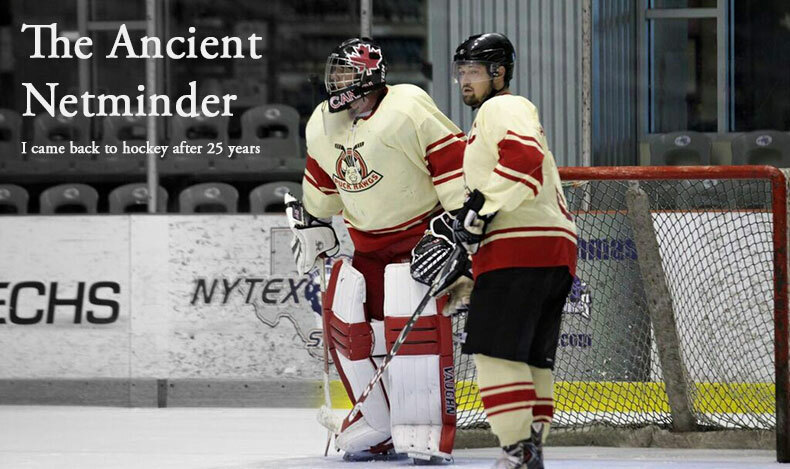 Maybe my age means every game is going to be a physical challenge and maybe I won't get to all the pucks I should. But maybe it's also about remaining positive, relying on my team mates and working harder not to feel like every goal and every game is entirely on my shoulders. That seems to be working OK right now.